The fiercest battles have met their match! 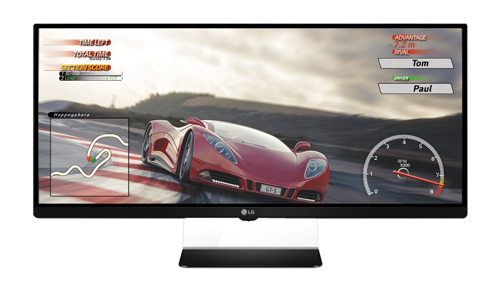 LG ranks #1 worldwide in the UltraWide monitor category, leadership that was fully on display at CES 2015 as LG premiered its expanding lineup of specialized monitors designed for gamers, businesspeople and media professionals. The company’s first 21:9 UltraWide gaming monitor (LG 34UM67) is developed specifically for graphics-intensive gaming. AMD’s FreeSync technology eliminates the screen tearing that occurs when the monitor and graphics card are out of sync. FreeSync technology guarantees the smoothest and most seamless gaming experience without any loss of frame rate. A panoramic field of view gives gamers the upper hand by revealing hidden spaces that were invisible on regular 16:9 displays. The monitor’s Black Stabilizer illuminates dark scenes where objects and enemies could be hidden. While the Dynamic Action Sync mode minimizes input lag, making gameplay truly real time. Popular games such as Battlefield 4, World of Warcraft and ArcheAge currently support 21:9 resolution with more titles supporting this resolution coming soon. Amazing clarity and color…in a viewing experience that’s totally immersive. LG’s curved 34-inch class UltraWide monitor (Model 34UC97) in Quad HD resolution (3440 x 1440) lets creative professionals such as graphic designers and photographers display multiple images at one time, while making it easy for media creators to see longer video image sequences or graphic representations of sound. Mac users will find the monitor particularly appealing as it’s compatible with Thunderbolt™ 2 and capable of high-speed bulk data transfers. Thanks to the 178-degree viewing angle of the In-Plane Switching (IPS) display, there’s no color distortion at any angle. LG’s 21:9 Curved UltraWide Multi-Display (Model 34UC87M) makes room for numerous display options, raising productivity levels for stock traders and other financial professionals who need to keep track of large amounts of data simultaneously. This monitor can be used as a trading workstation or a large dashboard to display charts, quotes or pending orders on each screen, allowing the user to explore a wider range of opportunities. LG has also introduced its Digital Cinema 4K Monitor (Model 31MU97) featuring 4K resolution (4096 x 2160), with more pixels than normal Ultra HD resolution (3840 x 2160). Not only does it display native 4K content with maximum clarity, it’s also well suited for handling Digital Intermediate (DI) processes. With over 99.5 percent Adobe Color Space, it’s the ideal monitor for accurate color management.